Once a year or so, I experiment with cooking beef. I guess it’s a sign that I really am obsessed with learning more about cooking since I don’t eat red meat. Kurt does eat red meat, and he’s my audience and critic when I attempt one of these meals. This time, I decided I really wanted to watch the transformation of beef short ribs during a long, slow braise. I felt it necessary to stick to an exact recipe, so I presented a couple of options from different books to Kurt. He chose the red wine braised short ribs from Stir: Mixing It Up in the Italian Tradition by Barbara Lynch. It’s a fairly straightforward approach to short ribs as far as I know. For side dishes, otherwise known as my complete meal, I made the creamy mascarpone polenta also from Stir and roasted some broccoli and cauliflower with whole garlic cloves. 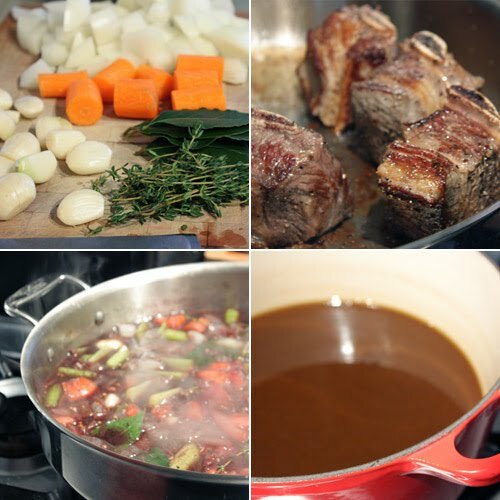 Lynch’s approach to the short ribs is to cook them even longer than usual at an even lower temperature. They can definitely be made in advance and simply re-heated for serving. In fact, that’s the best way to deal with the sauce. To start, the short ribs were seasoned well and then seared in a hot saute pan with canola oil. I knew not to crowd the pan, so I seared the ribs in two batches, and to my nose, my kitchen still smells like beef. Kurt doesn’t seem to mind. Once seared on all sides, the ribs went into a large roasting pan, and the sauce was started. In the same saute pan, onion, celery, carrot, and garlic were sauteed. When those vegetables were tender and browned, a bottle of red wine, thyme sprigs, bay leaves, peppercorns, whole coriander, and chopped tomato were added. That was cooked until reduced by half. Then, broth was added and brought to a boil. The whole mixture of liquid and vegetables was poured over the ribs in the roasting pan. The pan was covered with parchment and foil, and it went into a 275 F oven for five hours. I can’t take much credit for the meat doing what it does in a flavorful braising liquid while being slowly roasted for hours, but it did indeed arrive at the falling off the bone state. I let the meat cool in the roasting pan until touchable and then transferred it to another large baking dish. The braising liquid was strained into a large saucepan, and some of it was poured over the ribs in the new dish. Both the ribs and sauce were covered and refrigerated for a couple of hours. That was just enough time for the fat to congeal on the surface of the sauce, and that makes it much easier to remove than skimming a warm sauce repeatedly. The de-fatted sauce was then brought to a simmer and reduced while the short ribs were re-heated in a 300 F oven. Just before serving, a tablespoon of butter and some thyme leaves were whisked into the sauce. The ribs were well-received, and Kurt confirmed they were cooked to complete tenderness. Yes, they spend forever braising, and beef fat is a crazy thing to smell in my kitchen, but I had a new cooking experience and everything turned out great. That’s not the end of the story though. I have to tell you about the incredibly simple polenta. It was a basic polenta made with coarse ground cornmeal and milk. 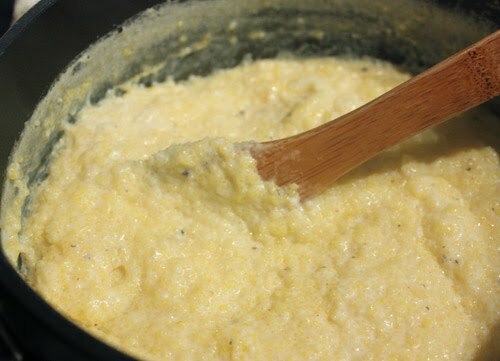 After the polenta was thickened and fully cooked, butter and mascarpone were stirred into it. That was it, but what a polenta it became. I’m told it worked well with the short ribs and sauce, and I can definitely suggest it along side roasted vegetables. The creamy richness of the mascarpone made it an amazing polenta. For this meal, we had slightly different things on our plates, but we both enjoyed a hearty winter meal with great flavor. i adore the combination of short ribs with a glorious red wine braise and polenta. bon appetit also has an excellent recipe. so sweet of you to prepare something for kurt that you couldn't enjoy yourself! Mmhhh, so hearty, flavorful and comforting! Good lord that looks amazing. I'm starving now! Good grace lisa, your short ribs look so luscious. Such a perfect way to serve this with polenta. Mmmm this dish looks amazing! It is so brave of you to try cooking with beef even though you don't like it...a definite sign that you are a true foodie at heart. I want to learn to cook everything, even things I don't think I will particularly love. Just to say that I did it. Honestly, though, my mouth is watering. I adore polenta - great recipe! You have no idea how much I'm drooling over those short ribs right about now. I. WANT. NOW. 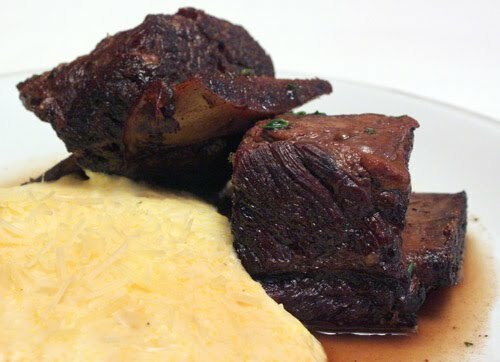 The short ribs look so succulent and sound absolutely delicious in combination with mascarpone polenta! I love braised short ribs, and can only imagine how incredible your house smelled (well maybe not for you if you do not like beef) but for me, it would have been heaven. Polenta has got to be the perfect accompaniment! Wow! It's bedtime for me, but I wish it were dinner, with a plate of that fabulous short ribs and creamy polenta. Okay I am seriously in love with this polenta. I never like with gorgonzola but the marscapone...I can't wait to try it!! This would make for such a lovely dinner! I made a recipe like this for my birthday dinner, but the recipe came out of Michael Symon's new cookbook (which is really great, by the way). I have just been reading your blog for a couple of weeks now and it's great. But, I do wish you would post the recipes. I'm dying to make the coconut mousse cake from the other day!!! Leah: Thanks for visiting! I do link to recipes when the original source is online. Otherwise, I link to books where the recipes are found. If I change a recipe significantly, I'll include my version. In general, though, I don't re-print copyrighted recipes. i'm not crazy about red meat either, but my family would love this. not to worry, though--i'd happily fill up on that smooth, decadent polenta! I'm not much of a rib eater but these look glorious! The real star of the show for me is the polenta! I now have red wine braised short ribs with creamy mascarpone polenta on the brain. The only remedy is to make and eat it but I'm a bit intimidated by the time intensiveness of the ribs. I have no doubt that they turned out magnificently but in the interest of immediate gratification, I'll start off with the polenta - mmmmm! Mmrroowwwwwwwww! Can't wait to try this. Hubby will love the ribs while I'll drool over the polenta. But, it WILL be appreciated. Thanks for the great recipe! oh my..must be really rich and flavourful! I would love to try cooking polenta one day. Gosh Lisa, those short ribs look dark and delicious! I do a red wine/lamb shank dish similar to this one and it is also dark and heavenly tasting. Over polenta your ribs would be divine. I completely appreciate the fact that you're willing to cook something that you'd never eat. And you've done wonderful things with that beef -- it's falling off the bone AND tender (sometimes the two don't actually go hand-in-hand). Of course, I'm with the group here... that polenta is totally calling my name! Oh my! I'm a beef lover and these look amazing! Adding these to my must try list! 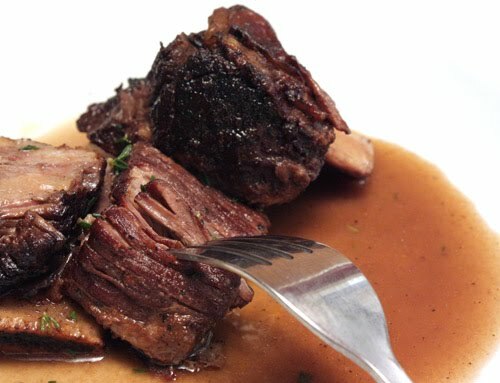 I've never made short ribs, but these looks very tender! My husband and son would love these! This looks super tender and delicious. Great click! This sounds so comforting. I wish I could do this kind of cooking right now. Good for you for trying a new technique. It must be the week for short ribs! Love your version and your pictures. Wow! This looks amazing! My Aunt has been a vegetarian her whole life and still cooks all the meat dishes for Thanksgiving and Christmas. I am always amazed!